Bold modernism. Classic contemporary. However you describe it, the Caprice Dining Chair is a unique blend of geometric lines and style, creating one of our most popular dining pieces. Caprice offers a brushed stainless steel base, finished in your choice of silver or gold. Atop the geometric angles is a high-back seat, built to keep you comfy. 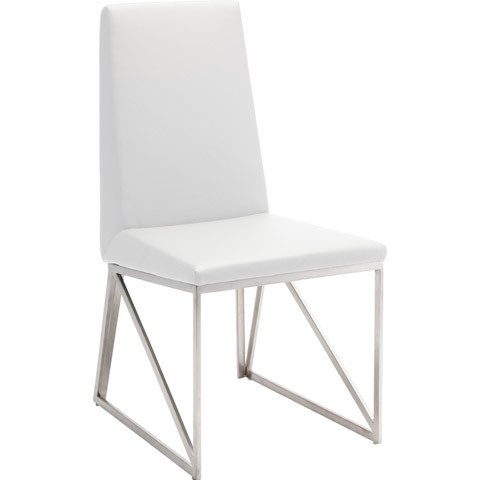 Whether it's game night with the family, or drinks and dinner with friends, the Caprice Dining Chair is designed to keep your space deliciously dapper. Upholstered in a vegan (and planet) friendly naugahyde. This item is priced individually, and only sold in MULTIPLES OF TWO (2).